You'll be taken off the-beaten-track to discover London's best street art, murals and hidden gems you won't find in the guide books! 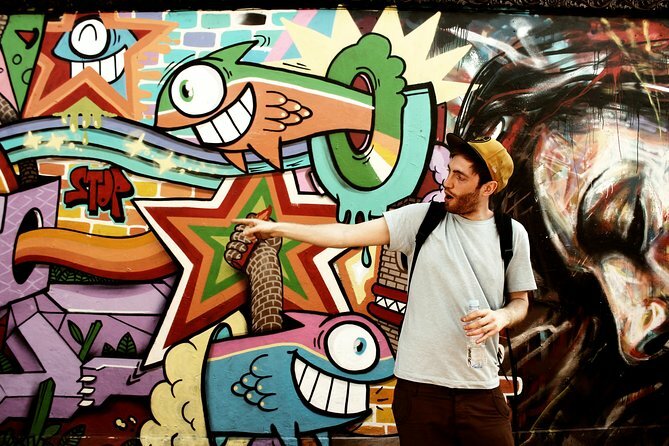 We'll walk the vibrant streets of Shoreditch and Hoxton, taking you into side streets and hidden alleyways to get under the skin of London's incredible street art scene. From huge murals and intricate stencils to finely crafted bronze sculptures and miniature masterpieces painted on discarded gum, you'll hear the stories behind dozens of works. The tour will finish at our creative warehouse space where your expert guide will teach you spray can techniques: How to spray paint free-hand, use stencils, and build up a final piece to take away with you. This activity meets in front of the Eat cafe at 95 City Road, EC1Y 1BD, this is right by Old Street underground station. During this combined street art walking tour and workshop you'll see street art done by artists from all over the world. Your guide will tell you about the different techniques used, and the stories behind some of the best street art in London. The tour will finish at our creative warehouse space in Hoxton where you'll have a 45 minute spray painting workshop. You'll have time to practice different spray painting techniques and use provided stencils to create your own piece of street art. The whole day is led by a talented street art guide who will inspire the group to get creative.